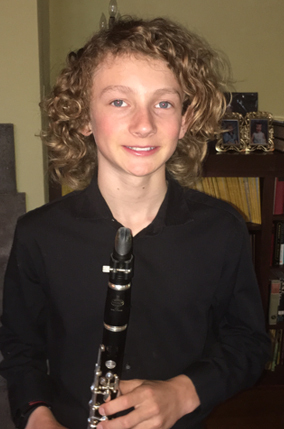 Ian started playing clarinet when he was 8 years old, in third grade at Balboa Magnet. He knew he had hit on something special when he played through the entire songbook in the first week! That summer Ian joined the Kadima Conservatory, where he is now principal clarinet for Junior Phil, Senior Phil, and KCP. Ian was honored to receive the Jack Kesselman award in 2016. He is currently 12 years old and in 7th grade at Lawrence Gifted Magnet. Many thanks to Beth Elliott, Jim Sullivan, and Art Sinanyan who have been phenomenal mentors for Ian over the last several years. Ian truly feels he has found “his people” at Kadima!